Chest physiotherapy is a diverse area which includes various techniques to prevent and to manage pulmonary congestion and associated respiratory complications. With increasing demands in respiratory conditions, various advanced techniques of the chest clearance have been developed of which prolonged slow expiratory technique is one of them. The technique is widely accepted in Europe and many other countries but is still not in practice in many developing countries and especially in Neonatal Intensive Care Units. Prolonged slow expiratory (PSE) technique is an emerging technique of chest physiotherapy which helps to clear the bronchial secretions in infants. The early respiratory care and management of neonates in the Neonatal Intensive Care Units (NICU) with pulmonary congestion and insufficiency is a vital step, which otherwise leads to various respiratory complications and increased mortality chances. In the womb, the temperature remains high and that very different from the external environment. When the fetus is expelled outside after delivery, the environmental change triggers the central nervous system which in turn causes the production of first breath sound, like a “gasp,” within the first 10 s after the delivery. As soon as the baby takes the first breath, a number of physiological changes take place in the pulmonary and circulatory system of the newborn. At birth, the lungs of newborns are filled with fluid. This fluid is absorbed from the respiratory system after the production of first breath sound. Increased oxygen in the lungs causes a decrease in blood flow resistance to the lungs. The lungs then inflate and begin working on their own, circulating oxygen into the bloodstream, and exhaling the carbon dioxide out. The indication of the technique is infants with bronchial obstruction, bronchiolitis, and hypersecretion. In conditions, such as bronchiolitis, bronchial obstruction, hypersecretion, etc., there is obstruction in the airway passages as a consequence of which the secretions are accumulated in the airways and leads to decreased lung compliance. The conditions are commonly seen in preterms, neonates with respiratory infection, and underdeveloped lungs. Deficiency of pulmonary surfactant may also be a risk factor for decreased lung compliance and thereby decreased clearance from lungs. Although many cases are reported with hypersecretion in newborns, all the cases are not generally associated with symptoms. As this is quite difficult for newborns to produce effective coughing, the hypersecretion and congestion lead to serious issues. Proper management of these medical conditions and effective lung clearance techniques works efficiently in minimizing the further complications. Among the chest clearance techniques, PSE is the technique which provides effective clearance along with soothing effect. Another recommendation for this technique is lack of application of emerging techniques of respiratory physiotherapy. Although the technique is effective, it is rarely in practice over the conventional methods of chest physiotherapy as there is a trend of following, the method which is already in routine practice since long. 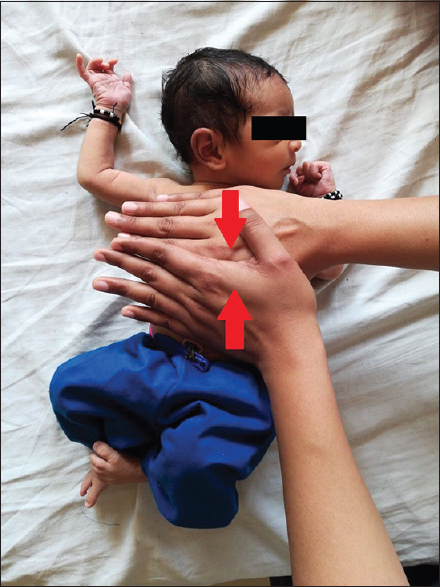 As the application of conventional methods of chest physiotherapy can irritate the newborn, PSE technique is not complex comparatively. Conventional chest physiotherapy has some contraindication and precaution to be maintained, which is not as such in PSE technique. Hence, PSE can be preferred over the conventional methods to reduce the risk of complications. The compression provided at the thorax and abdomen at the end of expiration provides resistance to active inspiration. This, in turn, manages to prolong the expiratory phase. This gentle compression also helps in promoting the clearance of secretion from the lungs. With needs of developing new and effective methods of respiratory physiotherapy, many advanced methods have been developed. Despite of enormous scopes, only few techniques are in practice. There is an absolute need of applying all those techniques and determine the efficacy of one over another in NICU. The authors would like to express their sincere thanks to, Dr. Aurodeep Dasgupta for his technical assistance in editing [Figure 1]. The part of this brief communication was published as an article titled, “Prolonged slow expiratory technique: A chest physiotherapy technique” in the proceedings of the national seminar on “Emerging Trends in Cardiopulmonary Rehabilitation” held on March 16, 2018. Hillman NH, Kallapur SG, Jobe AH. Physiology of transition from intrauterine to extrauterine life. Clin Perinatol 2012;39:769-83. Halliday HL. Surfactants: Past, present and future. J Perinatol 2008;28 Suppl 1:S47-56. Rimmer S, Fawcitt J. Delayed clearance of pulmonary fluid in the neonate. Arch Dis Child 1982;57:63-7. Christian PS. Chest physiotherapy for infants. Int J Physiother Res 2014;2:699-705. Lanza FC, Wandalsen G, Dela Bianca AC, Cruz CL, Postiaux G, Solé D. Prolonged slow expiration technique in infants: Effects on tidal volume, peak expiratory flow, and expiratory reserve volume. Respir Care 2011;56:1930-5.